While longstanding retailers were congratulating themselves on their online debut – we’re looking at you, Morrisons – and others were defeatedly downsizing their physical presence (small is beautiful, HMV); Argos was busy building the store of the future so far only prophesied by industry forecasters. A look closer and all may not be as it seems. 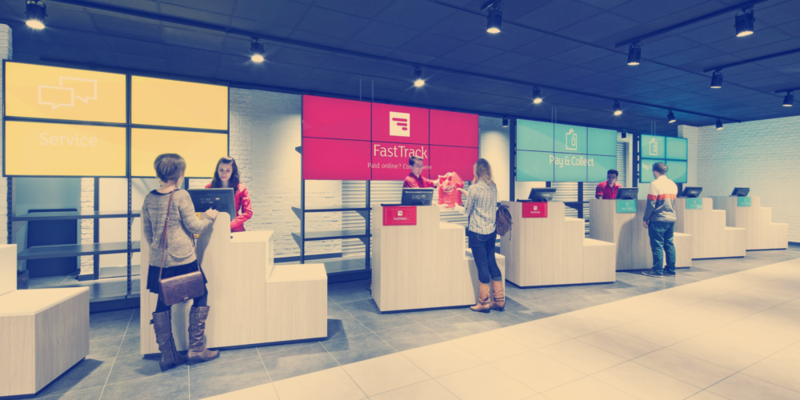 While a commendable effort has been made in terms of accessibility and utility in-store and – true to the name – pretty much anything that could be digital is digital from the window displays to the signage; evidence of a cogent understanding of the ever more complex purchase journey is notably absent. We know that social recommendations and sharing are increasingly crucial to shopper behaviour: peer-to-peer recommendations and reviews are the most common activities engaged in prior to a purchase decision. It would be fantastic to see Argos using their new platform to engage this trend, encouraging conversation through customers existing social networks. Instead, its efforts at increasing speed of discovery and delivery may in fact only work to discourage browsing altogether – and may put off their core customers through being too complicated. Shoppers don’t want digital, they want the ease of access to content that digital brings. They don’t want ‘mobile’ they just want to be mobile. As digital display systems start to become a ubiquitous high street fixture, it’s more apparent that they are something consumers expect to see. But people don’t want to ‘engage with brands’ in the same way that brands want to engage with them. They want a solution to the problem that has been driving them online for the past decade: choice. Utilising technology in-store means that customers can learn about a product range and its functions in more depth but offers them the chance to make a purchase there and then should they desire. To augment this immersive shopper experience even further, retailers could then offer up complimentary products, for example, a consumer buying a state-of-art kettle would be guided to a range of tea sets and sugar pots. Selling the lifestyle is nothing new, but with digital, it can be done far more intelligently. It’s paramount that merchandisers understand this potential in digital displays, beyond that of a moving catalogue. Competing with etailers who, with lower overheads, can undercut them on price is no easy task. Despite many purchasing decisions for high- end electronics being driven away from stores, high street retailers do still have the advantage of shoppers on average executing more of their decision processes offline, with these customers less likely to abandon a physical basket of goods than they are to navigate away from a digital cart when e-shopping. Technology should not be an end point but should act as a conduit to influence shopper behaviour. Interactive visual merchandising in shop window displays, for example, can attract customers in a way that can’t be done online. Subsequently, in-store mechanisms like free wifi and charging stations, as implemented by the Westfield Group, keep customers in store for longer by offering them an environment they actually want to be in. When considering Argos, you have to ask, is the brand really offering anything new? The retailer has always been a digital store of sorts, in the sense that customers never had the opportunity to browse products physically, but instead had to order through catalogues, waiting as their chosen goods worm their way down the conveyor belt. Tesco, on the other hand, have a lot to gain in increasing their digital spend in-store. It’s been well documented that online grocery sales generate miniscule profits for FMCG retailers, so their bottom lines stand to benefit if they can attract would-be online shoppers into the supermarket. In response, the brand has begun rolling out augmented reality technology to offer in-store customers the ability to view an entire product range before making a purchase. This is a great example of taking a benefit of the online shopping experience and adapting for in-store use. The public then get the benefits of viewing an entire product range with the convenience of being able to buy it there and then. Going one step further the supermarket revealed its plans to introduce facial recognition screens targeting their customers at the checkout. The technology will be deployed in conjunction with digital signage specialists Amscreen- owned by Lord Sugar- to allow targeted ads to be shown to specific groups of consumers. It may have privacy campaigners up in arms but it’s this kind of innovation that is really going to be the only thing to halt the rapid move to online. So as the PR fanfare subsides, I will be interested to hear whether both Argos and Tesco see a broader portion of the purchasing decision taking place within their store, affording them a greater influence. I’d hope for Argos’ sake in particular, that with all the money spent cultivating hype, the digital store of the future is not just a catalogue in disguise.